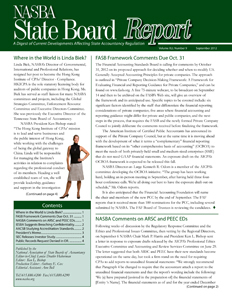 The Financial Accounting Standards Board is calling for comments by October 31, 2012 on its proposed approach for deciding whether and when to modify U.S. Generally Accepted Accounting Principles for private companies. The approach is outlined in “Private Company Decision-Making Framework: A Framework for Evaluating Financial and Reporting Guidance for Private Companies,” and can be found on www.fasb.org. A free 75-minute webcast, to be broadcast on September 14 and then to be archived on the FASB’s Web site, will give an overview of the framework and its anticipated use. Specific topics to be covered include: six significant factors identified by the staff that differentiate the financial reporting considerations of private companies; five areas where financial accounting and reporting guidance might differ for private and public companies; and the next steps in the process, that requires the FASB and the newly formed Private Company Council to jointly deliberate the comments received before finalizing the framework. The American Institute of Certified Public Accountants has announced its support of the Private Company Council, but at the same time it is moving ahead with the development of what it terms a “complementary” financial reporting framework based on its “other comprehensive basis of accounting” (OCBOA) to meet the needs of both privately-held small and medium-sized enterprises (SME) that do not need GAAP financial statements. An exposure draft on the AICPA’s OCBOA framework is expected to be released this fall. NASBA Director-at- Large Kenneth R. Odom is a member of the AICPA’s committee developing the OCBOA initiative. “The group has been working hard, holding an in-person meeting in September, after having held three fourhour conference calls. We’re all doing our best to have the exposure draft out on schedule,” Mr. Odom reports. It is also anticipated that the Financial Accounting Foundation will name the chair and members of the new PCC by the end of September. The FAF reports that it received more than 100 nominations for the PCC, including several submitted by NASBA. The FAF Board of Trustees is reviewing the candidates.